Di, Barbara and I met our new birding friend Harvey to check out a new trail in Del Haven this morning. We didn't see much, but we did hear and see our first Ovenbird of the year and then did some chores all afternoon. Nothing special really until we went to the Cape May State Park after dinner. What an unexpected treat. Di asked me to look at a bush to see a warbler, but when I looked at the bush, I immediately noticed something much more interesting. 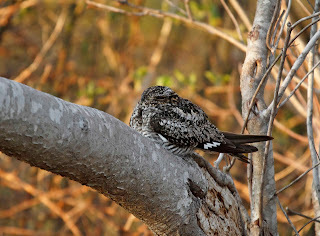 This is a Common Nighthawk which I have never seen roosting. I have only ever seen them flying. 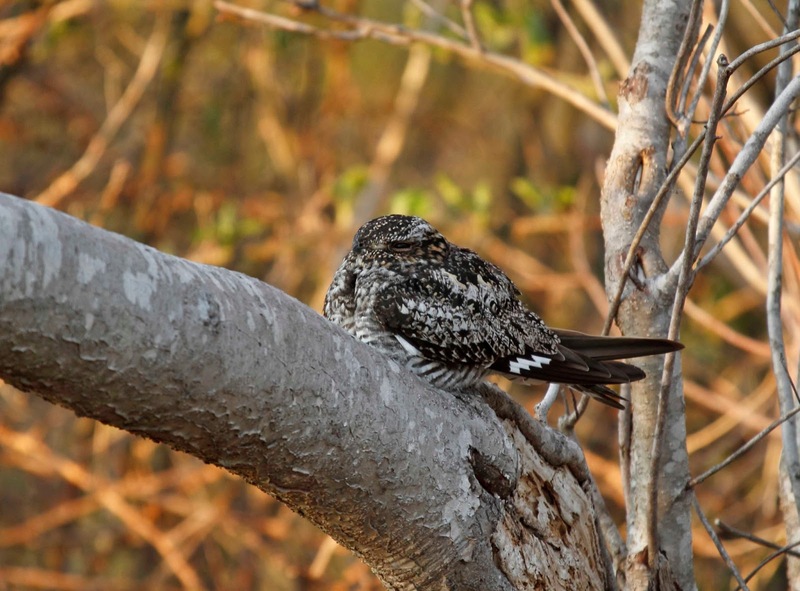 They are nocturnal birds that roost like this during the day and then fly around beginning at dusk catching insects in flight. They have extraordinarily long wings with white patches on the wrists which make the ID unmistakable in flight. Click on the photo to enlarge to see the tiny beak on this bird. I was so excited that I send out a text message about it. Within a few minutes, Richard Crossley showed up with his camera to see the bird. Richard is a famous birder and author of Crossley ID Guide series. We have 2 of them at the house. They are really good guides that have alot of photos of each bird in various "normal" positions and habitats. We stood there and watched the bird until sunset when the bird took flight, circled the pond and flew off into the night.